This is COMPLETELY outdated and unimportant now that the Shattering took place yesterday, but I’m posting it anyway because what use is a history of my adventures if I leave out something that I want to remember sometime down the line? 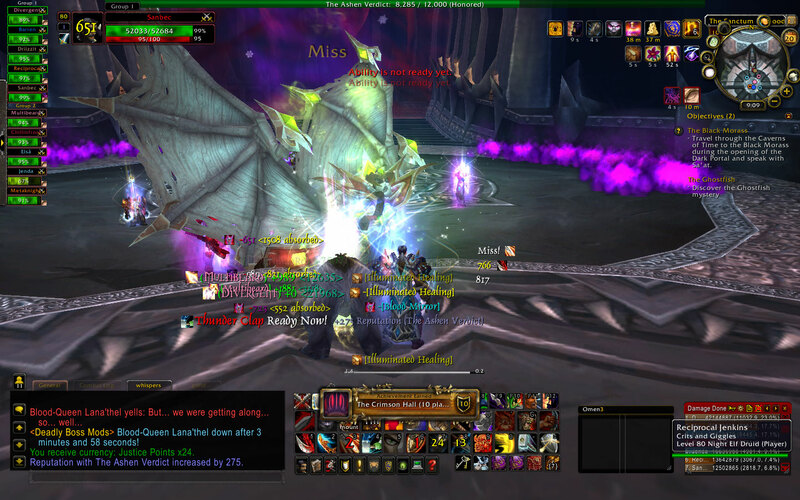 After we downed the LK on Friday night, it was decided that we would run alts in ICC on our usual Saturday time slot … and then we could extend next Friday and finish up. Well, the guild ran another alt run on Saturday afternoon, and looking at who ran in that, I was concerned about filling roles for the evening run .. especially, who the heck is gonna tank? Obviously Reversion’s other bear was going to be one, but who would be the other? Now, I was already planning on bringing Sanbec to DPS, because I knew that Multi wanted to bring his pally to heal, and obviously Analogue’s pally was also going to heal, so heals were presumably covered and melee would be needed. But with this development, I decided a couple of hours before the raid that it might be prudent to gem and enchant the prot set just in case. We ended up having to pug three spots. One of them was a complete unknown to us, a DPS warrior who turned out to be very good. For our hybrid, we got an elemental/resto shaman who turned out to be none other than my old buddy Barren from Apathy! He was in Hart’s group back when we downed Sindragosa … good times. And then this SC2 came along and .. well … anyway, it was SO AWESOME to get to raid with him again. And also reassuring to have yet one more person there who would be understanding and take things in stride if we had any issues with our not-as-geared tanks. Barren pulled in a boomkin that I vaguely remembered to fill out our last ranged spot. So now we have a full and competent group. As we’re getting ready to pull, I make an observation that has me almost laughing so hard I can’t see. You know you’re in trouble when … both of your tanks are sporting the ‘Jenkins’ title. We pretty much breezed through the Lower Spire, as well as the ugly twins. Not unexpected. Saurfang gave me bracers and pants. Yes, that’s right … Sanbec has better tank bracers than Kaly. *sigh* Anyway, when we got to this guy, I expected things to grind to a halt. I was slightly amazed when this result happened. Would you believe he dropped the tank sword AND the trinket? We moved on to Dreamwalker and that was pretty much cake with the heals we had. I got a belt from her. Like really, I think damn neared every tank drop that exists, dropped on that run. It was crazy! Well ok, the ugly cloak didn’t drop off Festergut, but that’s ok. It’s *really* ugly. Tags:Achievements, alts, Jenkins, Loot, raid, Screenshots, tanking, warrior, WoW, You guys really let me tank when my ICC-buffed health is only 5k more than Kaly's unbuffed?